Just how lucky can you get this St. Patrick's Day with two green crystal four leaf clovers and a couple of lady bugs? 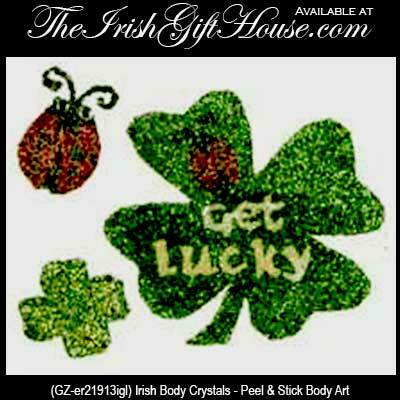 This 1 5/8" wide, peel and stick, crystal Irish body art is a 3 piece set that features the words Get Lucky along with two clovers and lady bugs. The St. Patrick's Day body jewelry is superior to a temporary tattoo because it has glittering crystals.